We were both going to the doctor today to get our vaccinations, but Daddy got the wrong date - it's not for another month! So instead we detoured to Jones the Grocer for father-son time. This daddy knows where the good deals are and Jones is one of them. 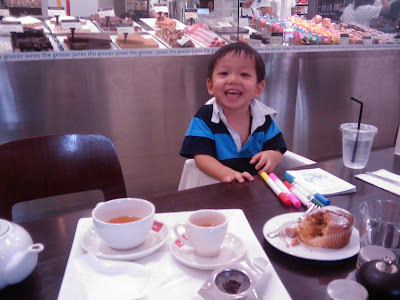 At this upmarket Australian cafe, a pot of tea is $4.50 which is very reasonable cos it can be shared by two, hot and ice water is complimentary, colouring pens and paper are provided for kids, service is excellent, there is no service charge or GST and parking is free! See what a good deal it is!? Ethan loves it here just like Daddy. We are now sharing "vanilla cream" tea (caffeine free) with honey!